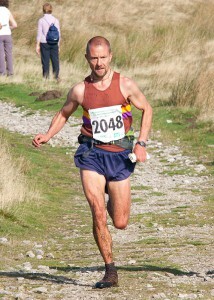 Hi, I'm Dave Taylor, Fell Running Guide. I'm an experienced, competitive fell runner (I run as a member of Dark Peak Fell Runners) having won the 2015 English Fell Running Championships for the V50 age category and come 2nd in the British Championships. In 2018 I won the Elite Veterans class of the OMM Mountain Marathon. In addition to fell races I have also completed the "big three" rounds; the Bob Graham Round, Paddy Buckley Round and the Charlie Ramsay Round, running the majority of the Ramsay Round solo. My background is as a qualified teacher with over 12 years experience teaching sport and outdoor activities and I hold several outdoor qualifications including the Mountain Leader Award. I am a UK Athletics Coach (specialising in Fell and Mountain Running) and I also hold the British Orienteering Level 1 Coach Award and I am First Aid qualified. As Fell Running Guide, I have contributed articles for and featured in magazines such as Trail Running, Outdoor Fitness and Men's Running. I was the race planner for the 2014 Marmot Dark Mountains race and course planner for the 2015 RAB Mountain Marathon. I am also involved in the organisation of races including the Edale Skyline and the Ultra Tour of the Peak District. For a number of years I have been a member of the volunteers who deliver the Fell Runners Association navigation courses. My passion is spending time running on the trails and fells, mainly in the Peak District but also further afield. Whether it is on a remote moor in thick fog with map and compass out or on a sunny trail, I would love to share some of these experiences with you, so get in touch to discuss what I can offer.